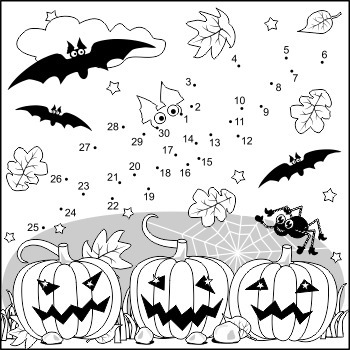 This is Halloween themed connect the dots (or join the dots, else dot to dot) picture puzzle and coloring page featuring the Halloween scene with bats, pumpkins, spider and spider web. Directions: Draw a line from dot number 1 to dot number 2, then from dot number 2 to dot number 3, 3 to 4, and so on. Continue to join the dots until you have connected all the numbered dots. 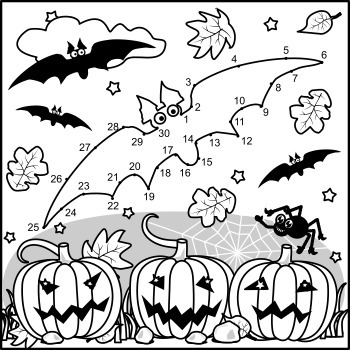 Then, color the picture! Download zip folder contains two separate PNG graphic files - the puzzle itself and answer file of smaller size. Also task text (directions) is included as TXT file. Both graphic PNG files are of high quality for crisp and clear printing.